I've tested a wide range of sketchbooks over the years! All you need to Boggy Doodle is a sketchbook and a pencil or pen. Yet choosing a sketchbook is not as easy as it seems. Sketchbooks vary in size, shape, paper quality, binding, cover type, accessories, cost and colour. There’s a huge choice available. The right sketchbook can make sketching a joy; the wrong one can frustrate you and hinder your progress. So which one is best for Boggy Doodles? Above all, you need to find a sketchbook that is lightweight, portable and robust enough to cope with regular outdoor use (I've dropped my sketchbook in a bog on more than one occasion…). That said, the best sketchbook is simply the one that you use most often and the only way to find it is through trial and error. Experiment with different sketchbooks and accept that your needs and preferences will probably change over time. I started sketching in Moleskine's pocket-sized, blank notebooks. They are lightweight and small enough to doodle in without feeling self-conscious. I also loved the range of colours they came in. They are a great stepping stone towards sketching if you already carry around a little lined notebook in your bag. Remember a sketchbook doesn't have to be exclusively for sketching; you can still write your to-do lists in them. As my sketching habit developed, I dabbled with A4 sketchbooks; some people love them but I quickly got tired of carrying them around. After testing out all sorts of shapes and sizes, I've found A5 sketchbooks are the perfect size for me. I like sketching in portrait sketchbooks, but many other people prefer a landscape layout; it's purely a personal choice. 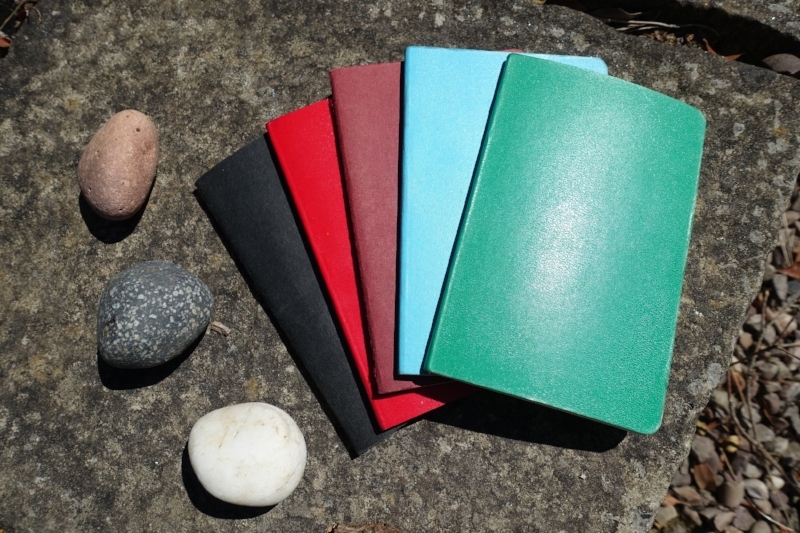 Hard-bound sketchbooks are more robust and weather-proof in the field, especially ones with an elastic band to keep the book securely closed when not in use. I now prefer hardbound, a5 (portrait) sketchbooks. l-R: Travelogue Hand Book; Ryman's sketch book; crawford&black field sketch pad (from the works) and bookbinders design blank notebook. Avoid getting anything too fancy to start with. You can easily be paralysed at the thought of ‘spoiling’ a special sketchbook and stop sketching altogether. My husband kindly commissioned a beautifully hand-crafted, sketchbook for me, featuring my name and artwork. Four years later, I still haven’t dared make a mark in it! Ryman and The Works have a good selection of affordable sketchbooks in the UK. And don’t forget your local, independent art shop. Turners in Stockport is brilliant. If a sketchbook is too special, you may not want to use it! The more I sketch, the fussier I get about the quality of the paper within the sketchbook. I like a smooth, bright white, heavy paper that can take a light watercolour wash. And I prefer hard-bound rather than spiral-bound sketchbooks because I like having the option of sketching over both pages. Despite a huge collection of sketchbooks, my perfect sketchbook remains a little elusive. I like the Travelogue series of sketchbooks by the Hand Book Journal Co. ( I just wish the paper were a little whiter). Moleskine hardbound sketchbooks are good quality and reliable (if a little uninspiring), and if you want to treat yourself, I highly recommend the Fabriano Venezia sketchbooks (although I do wish they came with an elastic band to keep them closed!). my next sketchbook is a 5.5 inch square travelogue by hand book journal co..
my favourite so far… the fabriano venezia 6x9 inch. As you become a regular Boggy Doodler, you’ll find your sketchbook becomes one of your daily essentials (keys, phone, purse, sketchbook…), so it’s definitely worth a little effort to find one you enjoy using and want to carry around with you everywhere. Let me know in the comments below if you've got a favourite sketchbook. If you’d like to learn more about outdoor sketching equipment, sign up for one of my Boggy Doodles workshops or contact me to discuss a possible bespoke event.